As with most clubs, the money raised from sponsorship and advertising is a vital ingredient in ensuring that we are able to continue to operate as a going concern. Most of our sponsors are local companies and we would encourage you to support them in return if you can. Should you require the kind of services offered by our sponsors or advertisers, please speak to them to see if they can be of service to you. Mention the club, you never know there may be a deal on offer. Sponsor the match ball for a game. Package includes 2 match tickets, a mentions over P.A., in the match day programme, on the club website and on our social media sites. Sponsor your favourite player for the season. Name in match day programme and ever lasting gratitude of the player because he is not one of the players “without”. Should you be looking for a larger sponsorship opportunity the club is happy to negotiate an exclusivity deal whereby we can develop a relationship with your company. We can offer use of our bar, pitches, car park etc by your company as well as any, or all, of the options above. Give us a call and let us know what you are looking for. We will do our best to meet your requirements. Our, award-winning, match day programme is bought by a large proportion of our supporters. It is also prized by programme collectors and "ground hoppers". All advertising is in full colour and can consist of a four-page, half page or quarter page. The fee covers a whole season of 20 league games plus potential home games in cup competitions including the FA Cup and FA vase competitions. 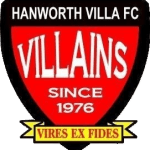 Our website, HanworthVilla.co.uk, is the first port of call for club information for our fans and visitors alike. Adverts can have the ability to click through to your own website or, if you do not have a web site of your own we can provide space on our site where we will include information on your company and the services you provide. Advertise your company around the perimeter of our pitch with full-colour banners all season long. Banners are 2400 x 800 (longer on request) and can display either your own design or a design that we can create for you. Prices include the supply of the banner. Your company logo, linked to your company, will be displayed on our website and promoted via our social media services. Place your advert at the rear of our main stand. 6 panels available. Each panel is 2200 x 1000. We can offer 1, 2 and 3 panel options.